The Second Age: Palin Defends Paul Against the Media's Hunt for a "Gotcha Moment"
Palin Defends Paul Against the Media's Hunt for a "Gotcha Moment"
Rand Paul, son of frequent presidential candidate Ron Paul and now the GOP's nominee for the US Senate seat in Kentucky, has run up against some difficult questions and interviews in the week since his primary victory. 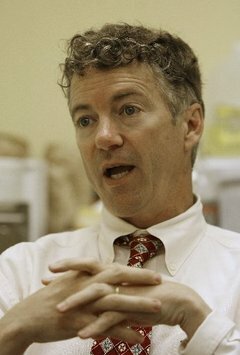 A self-proclaimed Tea Partier and a die-hard libertarian, Paul has gained much of his political traction in recent months because he espouses the view that the federal government should stay out of nearly all private affairs, greatly reduce all taxes, and drastically cut spending. These are the issues he ran on, and no doubt why he trounced Kentucky Secretary of State Trey Grayson in the primary. The next day, on NPR's All Things Considered, Paul discussed his views on the Civil Rights Act of 1964, equivocating about whether he would have supported the provisions that forced private businesses to allow black people into their establishments, as well provisions in the Americans with Disabilities Act that require accommodations for people with impairments. The interview has created quite a stir, and Paul has found himself in the national limelight for his seemingly radical views on the role of government. Now, Republicans like Sarah Palin are coming to his defense, saying the press was simply trying to catch him in a "gotcha moment." It can't be denied that Rachel Maddow has a political agenda. She is a liberal and supports the role of government to intervene when the civil rights of US citizens, from blacks to gays to individuals with disabilities, are being infringed upon. Paul claims to abhor the idea of any form of discrimination (as he said over and over again in the interview), but does not seem to agree with the notion that government should step in when private businesses are discriminating against potential customers for any reason. Only, he would never overtly say that. But is the media not right to be pressing these questions? Don't voters have the right to know where Paul stands on policy issues dealing with the role of government, even if it's not related to legislation that's currently on the table? Knowing where a candidate stands on a wide range of policies is a lot more useful than knowing about a candidate's personal life, or whether he or she served in Vietnam (though that should certainly be fair play as well). This isn't about looking for a "gotcha moment," though if that's what you want to call it when a candidate says something that they believe, that the average American probably doesn't agree with, then maybe there is such a moment that's being sought. But that doesn't mean that it's not fair to go after that quotation. (Palin also thinks Katie Couric was trying to force her into a "gotcha moment," but in reality the vice presidential candidate was just saying asinine things because she had no idea what she was talking about.) People deserve to know what candidates believe, not what they try to say so that they don't piss anyone off and get elected more easily.